The Hampton Inn - Suites Lake Mary At Colonial TownPark hotel of Lake Mary Florida is strategically located in the charming distraction-free Town Square atmosphere of Colonial TownPark yet still close to many tourist sites and attractions in Central Florida. 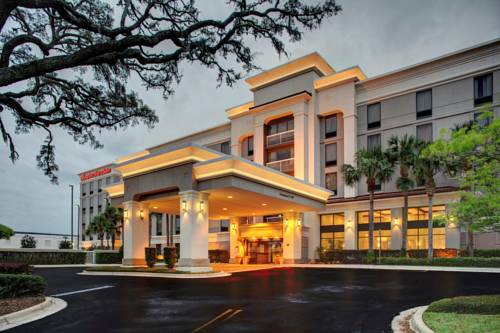 This Hampton Inn - Suites hotel is a state of the art facility set among picturesque oaks and has 131 exquisite hotel guest rooms and suites designed for the business traveler as well as the leisure traveler. Complimentary in-room high-speed internet service voicemail meeting facilities guest laundry suite shop outdoor hotel pool whirlpool and a fitness facility are just a few of the featured amenities at our Hampton Inn - Suites Lake Mary At Colonial TownPark hotel of Lake Mary Florida. Our standard of excellence at Hampton Inn - Suites Lake Mary At Colonial TownPark hotel of Lake Mary Florida ensures your comfort and satisfaction on every stay. Come and relax with us at the hotel pool or spa or in our covered gazebo. Stroll around Colonial Townpark to catch a movie do some shopping or dine at one of many alluring restaurants. If you choose to venture further we are close to all Central Florida attractions. We love having you here at the Hampton Inn - Suites Lake Mary At Colonial TownPark hotel in Florida.